On July 2 Unilever announced the sale of its Oss factory in The Netherlands to the Dutch transnational Zwanenberg Food Group. Over 300 workers in Oss produce Unox, Bertolli and Knorr products. Unilever retains the intellectual property - brands and recipes - along with responsibility for sales and marketing. Zwanenberg takes ownership of the facility and employs the workers under a long-term agreement with Unilever. With this deal, the Oss workers lose their Unilever pensions. While Unilever secured a long-term income stream under the arrangement with Zwanenberg, in negotiations with the FNV Unilever has refused to offer guarantees on continuity of pension rights beyond 3 years or on employment beyond stating that no one will lose their job in 2018. In support of the union's demand for meaningful guarantees on pension and jobs, the FNV called a 24-hour strike November 2-3. 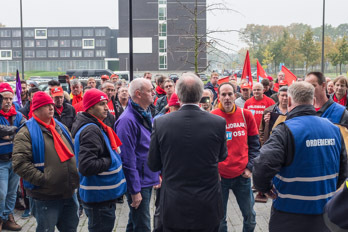 Hundreds of Oss workers demonstrated at the ground-breaking ceremony at Unilever's new Foods Innovation Centre in Wageningen, where CEO Paul Polman was present. Another strike will begin at midnight tonight, November 6, with more actions planned. With Unilever's portfolio in constant flux, it is essential that all Unilever workers secure meaningful continuity of employment terms and conditions including pensions in the event of a sale.